The name seems very apt for a passionate and very personal family business. 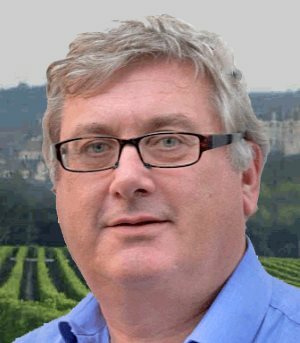 Tim North spent 18 working for a company that is France’s largest exporter of wine, spending a lot of his time in France and getting to know its different regions well. Tim took the decision to step off of the more corporate treadmill and, along with his wife Jill, they set up Joie de Vin specifically to import the smaller, artisan French wines that they loved, most produced in very limited quantities of 2,000 to 3,000 bottles. The wines are imported directly, with Tim and Jill having personally visited every producer in their small portfolio. Tim (right) says “All of them share a passion for making great wine and protecting the environment. Some are certified organic, all work to apply sustainable techniques,” another important factor in deciding whose wines they will import and sell. Having started off with a handful of producers from the Loire and Languedoc-Roussillon regions, Tim also says that they have visited many more great producers and will gradually expand the portfolio, and already in the selection tasted below there is one excellent little Burgundy, with more, no doubt, to follow. Joie de Vin will be pouring 12 of their wines at my London Festival of Wine (and offering an exclusive discount on purchases on the day), but meanwhile you can order from joiedevin.co.uk with a six-bottle minimum order, free delivery if spending £95 or over, and there’s a selection of mixed cases too. (2017) This sparkling wine from the Loire Valley is an unusual Blanc de Blancs blend of Chenin and Chardonnay, made by the traditional method. Moderately small bubbles rise through the glass, and it is the fresh apple cut of the Chenin that dominates, before a little custardy infill from the ripe Chardonnay. In the mouth this has loads of flavour and fruit sweetness, though perhaps the mousse could be a little more fine. Tangy, with citrus and quite a vivacious feel, it drinks well and would be a fine aperitif fizz. (2017) An unusual sparkling rosé, made in the Loire Valley by the traditional method, with second fermentation in individual bottles. It's a blend of Gamay, Grolleau and Pineau d'Aunis, and has quite a deep colour with streaming small bubbles. On the nose it is all about buoyant, cheerful red fruits, summery and bright with rose-hip and strawberry. In the mouth that delightful red berry fruitiness and freshness continues, a cut of tart raspberry to add lovely balancing acidity, but the sweet elegance of the fruit powers through. Delightful and different. (2017) Yet another Languedoc pink that's a ringer in colour (and grape blend, 80% Grenache and 20% Syrah) for Provence rosé, but in this case, quite different in character: after a light, summer fresh nose there's real intensity on the palate: more tang and more fruit concentration than most Provence examples, real zip with lemony acidity powering through decisively. (2017) This is 100% Pinot Noir and comes from a small producer in the very south of the region, currently in conversion to organic certification. The colour is deep and the most striking aspect of the nose is the briary, truffly, lifted cherry floral character that is reminiscent of Cru Beaujolais in a way, the palate showing delightful red fruit ripeness and freshness - cherry and raspberry - before a drying, savoury tannin, nimble acidity and a little smoothing from its time in large oak 'foudres' eases the finish. Serve it a little cool and it is a sheer delight. (2017) Another deeply-coloured wine, organic certified and coming from the traditional Corbières appellation. It blends 40% Syrah, 30% Grenache, 20% Carignan and 10% Mourvèdre, all aged in oak barrels, 60% of which were new. It's immediately serious and savoury on the nose, vinous and darkly-hued, with damson and black cherry, a wisp of smoke and a bit of graphite in there too. Solid and powerful in the mouth, the vanilla of the oak helps soften the tannins, but it is a structured wine, crying out for beef or lamb - either that or give it some time: the fruit, black olive savouriness, density of texture and structure suggest to me this will cellar well for five years.